LNG tankers can make a profit just sitting offshore at present because the spread between the price of gas for delivery next winter and month-ahead prices is so wide they can make money from storage alone. This so-called ‘cash and carry’ arbitrage is a typical consideration for storable commodity markets but is unusual in an LNG context. 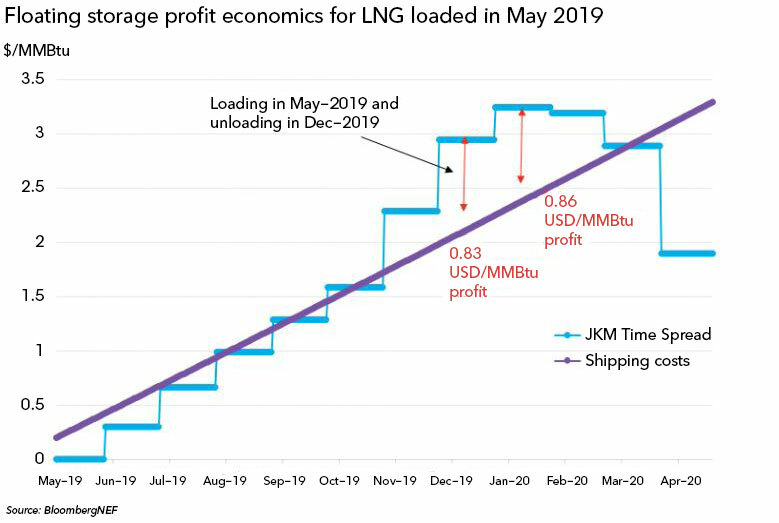 The forward curve for JKM, the Asian LNG benchmark, suggests that a time arbitrage has opened up for long-cycle floating LNG storage. Because of the discount of nearby futures prices to far-dated futures, it is theoretically profitable to buy prompt delivered LNG, simultaneously sell that LNG for forward delivery and pay the cost of storing the LNG on tanker for several months until the delivery period of the forward sale. According to BloombergNEF, LNG volumes loaded to a tanker in the beginning of May and re-delivered in January 2020 would allow for the maximum profit from the operation and the net profit of $0.86 per MMBtu of unloaded volumes. Notwithstanding positive netbacks, the opportunity cost is still too high for market players to execute this operation. As an alternative to long-cycle floating storage, an LNG vessel can be used at maximum capacity for continuous delivery operations. In case of 100 percent capacity utilization of an LNG tanker for deliveries from U.S. to Japan from May to January, net profit would be $12.20/MMBtu of the tanker capacity, significantly higher compared to the $0.86/MMBtu of long-cycle floating storage. 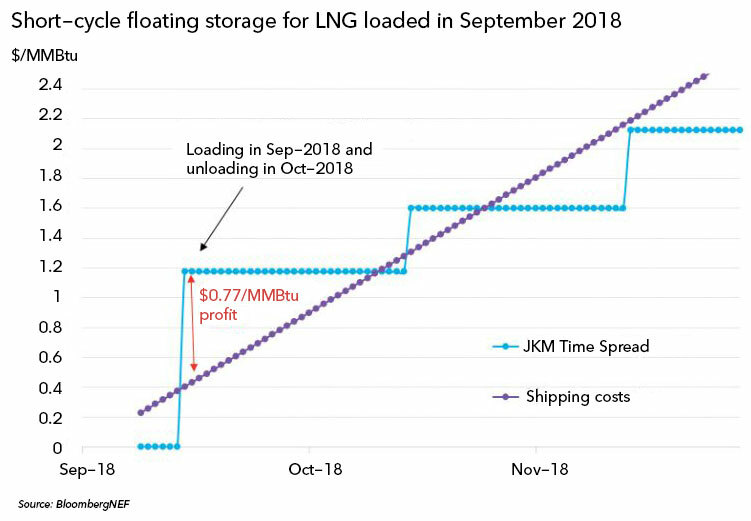 Unlike long-cycle floating storage, a sufficiently steep JKM contango could potentially unlock real arbitrage opportunities for a fast-cycle floating storage, as already happened in August 2018. Prompt delivered LNG loaded to a vessel at the end of September 2018 and re-delivered at October forward prices would have yielded as much as a $0.77/MMBtu profit margin. The short-term nature of the operation greatly reduces the opportunity cost of the alternative usages of the LNG tanker.